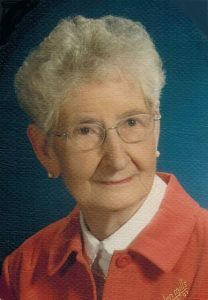 Sylvia R. Livergood, 93, formerly of Philipsburg, died Thursday, May 25, 2017 at Arista Care Hearthside, State College. Born June 5, 1923 in Brisbane, Australia, she was a daughter of the late George Edward Reid and Daisy Griffiths. She met her husband, Paul F. Livergood, while he was serving during World War II. They married March 27, 1945 in Brisbane, Australia. Following the war, she and her husband returned to the United States and on Nov. 22, 1950, she received her American citizenship. She had worked at Sylvania and the General Cigar Factory from which she retired. She was a member of the Cosmopolitan Club where she met her fellow war bride friends. She was also a member of the Trinity United Methodist Church, Philipsburg, where she often helped with the blood mobiles and funeral luncheons. She was a good cook. She enjoyed knitting, traveling (especially to the ocean) and taking care of her grandsons. She loved to read and always read every National Geographic from cover to cover. She always referred to Australia as home. She is survived by her daughter, Maureen F. Coble and her husband, Randy of Kylertown and three grandsons, Bradley Coble and his wife, Bianca of Pittsburgh, Sean Coble and his wife, Krysta of Washington, D.C., and Paul Coble of Washington, D.C.
She was preceded in death by her parents, her husband on March 31, 1980, and her son, Barry. A funeral service will be held at 11 a.m. Tuesday at the Trinity United Methodist Church, Philipsburg, with Pastor Michelle R. Bodle officiating. Burial will be in the Philipsburg Cemetery. Friends will be received from 10 a.m. Tuesday until the time of the service at the church. Memorial contributions may be made to Trinity United Methodist Church, Memorial Fund, P.O. Box 465, Philipsburg, PA 16866. Online condolences to the family may be made at www.dahlgrenfuneralhome.com. Arrangements are under the direction of the David K. Dahlgren Funeral Home, 228 N. Centre St., Philipsburg, PA 16866.